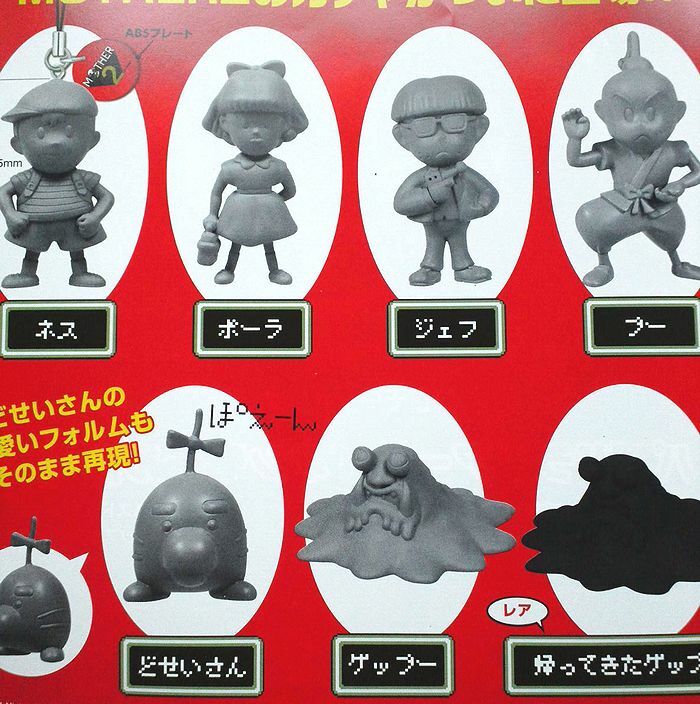 These will be available from those capsule toy machine things, and each capsule toy is 200 yen. They supposedly become available starting this month, and may already be available in some places in Japan, but I don’t have any confirmation on that yet. Thanks again to pk_stan! And if anyone out there comes across new info, let me know in the comments! 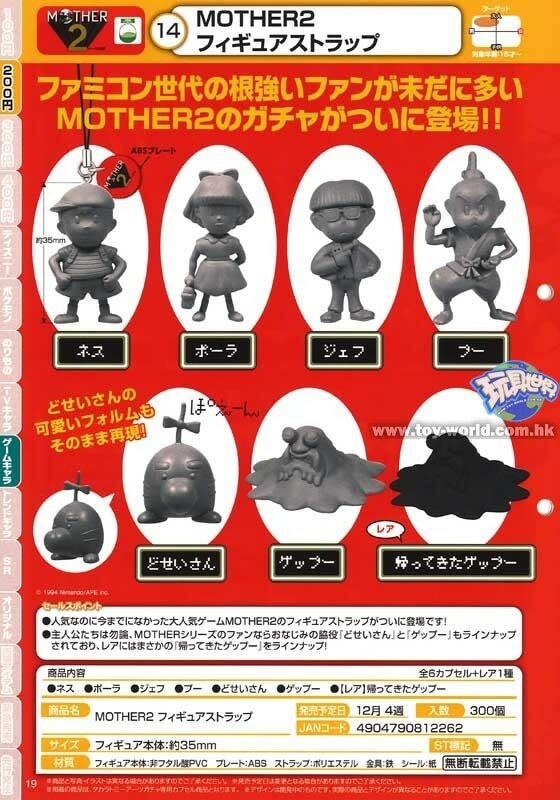 32 Comments to New MOTHER 2 Figure Straps Incoming! Are they supposed to be in black and white? Are we meant to paint them ourselves? No, they are just mock-ups. They haven’t finalized painting them yet. 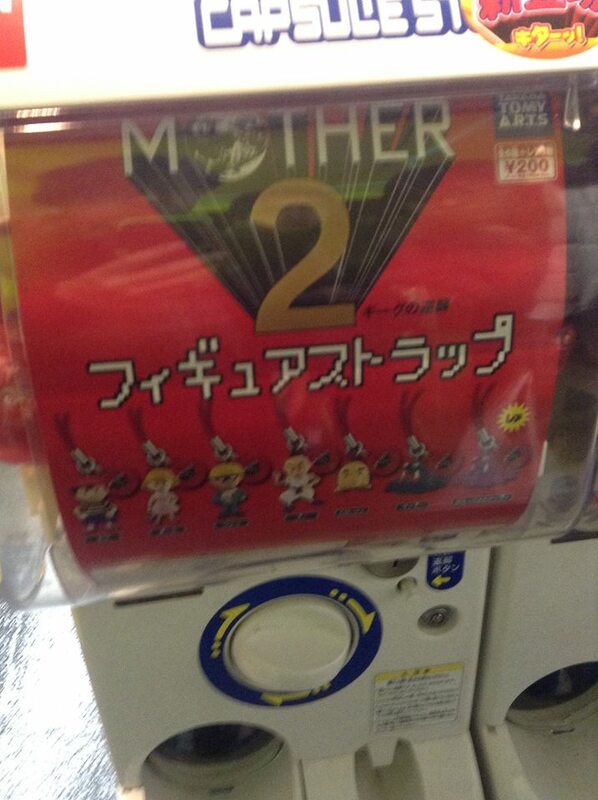 Finally, affordable Mother 2 merch. So they’re about $2 US each? With shipping and markups we’ll probably pay $5-10 each. That’s not bad for earthbound merchandise. I hope they are cheap when they start to hit eBay. I really hope nintendo releases some UK/Europe Earthbound merchandise sometime soon, if at all, so I don’t have to pay mega insane prices. I’m mostly interested in getting the rare one since it’s a character that hasn’t had a figure yet, but I’ll still get all of them! It would be really nice if there was a club nintendo reward like a poster or something earthbound-related. 2013 really was a good year for the series wasn’t it? In my digging for info on these, I found a site selling bags of 50 assorted figures for around 8,000 yen. I believe the site was for retailers to buy stock for their machines. I’m not positive, but I don’t think it was for the average joe. Either way, the site was sold out. My point is that I hope they stay cheap also. I’m so excited that the series is getting so much attention! I can already see people getting ahead of themselves, thinking that this is a ‘sign from Nintendo’. Still, very cool, even if they stay in Japan. So cool. I have nothing Mother/EarthBound themed at all in my home (Aside from some data on my Wii U of course). I’m not rich, so I’ve stuck to collecting Pokemon merch. What did I just say? Oh, no! Now all the haters are gonna say “Pokemon is gay trollololol”! Know what? Hater’s gonna hate. I said it. Twerking and YOLO! AMERICA!!! …I don’t know how this comment turned out this way. I’m going to click the send button cause I just don’t care. They just look like the UFO prize catcher banpresto stuff that was released in 2010 so I’m not really excited. Although since I missed out on a lot of those i’ll try to track them down. So, what you’re saying is that I need to go out to Akihabara immediately after work and go buy a bunch of these to sell on eBay? why is the one belch just a silhouette? Because that one is a rare version. It’s common practice to put silhouettes for rare ones like this. OK, just spent the day in Tokyo. Searched through Nakano and Akihabara and saw 0 EB Gachya machines. Did get some nice stuff in Nakano (Shinobi Saturn for 1/2 of what I could find on ebay!) but no capsule goodness =( Anyone been able to find anything? Hey guys, I’m in Fukuoka, and I plan to launch an all out attack on these at the end of the week. If you look at the ad, it says they release the fourth week of december, which is this week. Sadly, it’s also a Holiday week. I’ve also got the Amazon.jp link cornered so I can buy 2 full sets: one for my mother hoard and the other to give out and put on my things. This Friday though, I’ll visit all the big city shopping centers and give a report. I’ve also looked around today and yesterday a bit, but nothing to report. Wait, so they’re just gonna be selling full sets (minus the rare Belch apparently) on Amazon? That ruins some of the fun, lol, but I guess I’ll be ordering one of those. Thanks for the update and that link Fukuokaman. I think I’m going to order 2 sets as well! Alright, so here’s the big update. 2) They came here from Amazon! So now I have every one but return of Belch. I actually ordered another, smaller set with Return of Belch, and am selling it to a homie. Glad I could contribute something to this awesome website. Please keep up the great work Mato. Can anyone give me a link for where to get these at a reasonable price and allows shipping to the UK? The UK never got anything from the series before the virtual console release so I would love to get some merchandise when it is new and cheap! I Want Ness! How i can buy one please?